VT Emake - excellent business template for Joomla 3.0, developed by the team of professionals Vtem. The original design layout worked very efficiently, there are 4 color schemes that allow you to pick the best look of the site. This template contains the adaptive function, allowing him to display properly on mobile and tablet devices. Having the support of popular content management manager K2 template gives an additional set of functions and features in the publication and posting materials on the site. 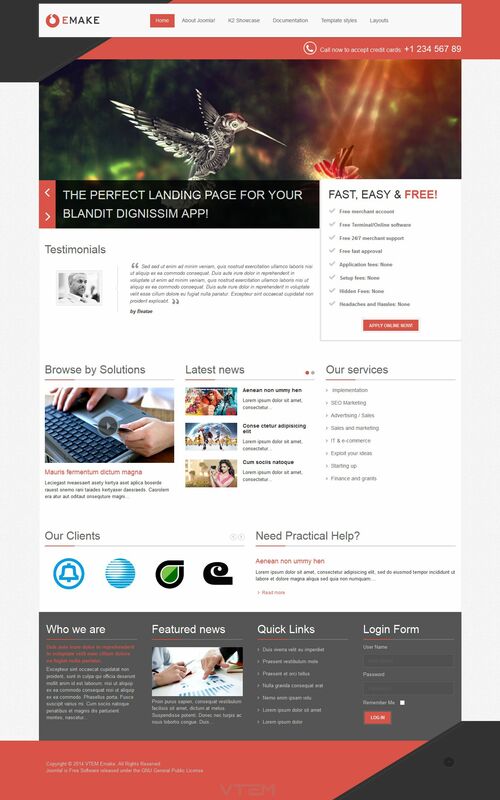 VT Emake - an ideal choice for creating high-quality and stylish business site, business cards or corporate web - resource.